Nothing is more American than apple pie and that’s why it’s also the perfect drink to help celebrate American Thanksgiving. This day also truly marks the beginning of the Christmas season (despite retailers around North America stocking their shelves with Christmas items as early as the end of summer) and so with that in mind, I present to you the holiday gift guide for all the little sippers in your life! Have you ever wanted to identify all the notes going on in your glass of wine? That’s not for me, but there are certainly folks out there that would like to have a better idea of what they’re smelling and drinking. This set offers your bottles of six of the most popular scents in red and white vino, giving you a chance to better recognize what the nose knows! I’ve already written about this company’s Mojito Revolution Kit, so I figured I’d give some time to their newest products, as well: the Margarita and Cosmopolitan releases. Each set is $30.00, but buy all three and you save a little money. With these collections, little sippers can make different versions of the cocktails to share with friends throughout the next year. 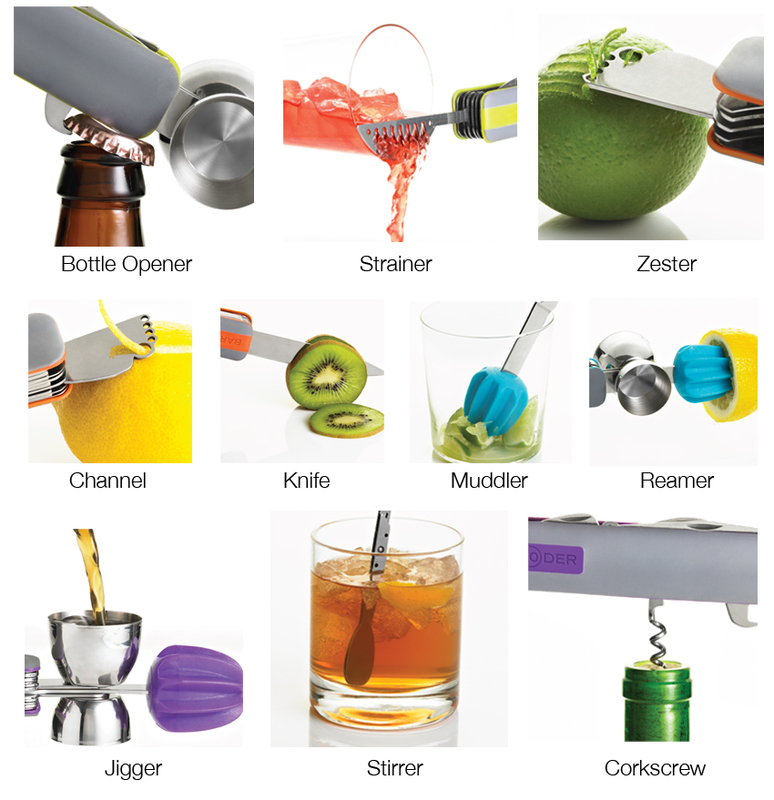 This is the Swiss-Army knife of the boozing world! Complete with a jigger, muddler, corkscrew, bottle opener, knives, stirrer, strainer, and so much more, this 10-tool piece will keep aspiring mixologists churning out drinks and never needed to jump between different utensils. For the cocktail connoisseur, this magazine offers all the best tips and tricks for what they call “liquid culture”! The magazine highlights drink and food recipes, new products, and other issues going on the world of booze. The price point is pretty reasonable, too. Mrs. Sip and I own one of these and it can make parties quite interesting. 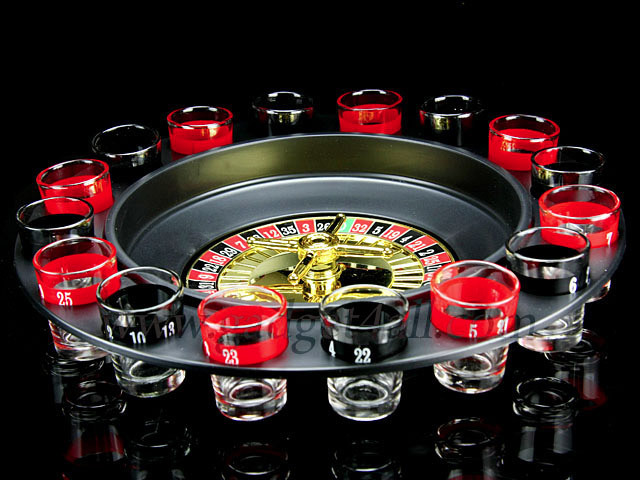 We fill each glass with random liquors and folks spin the wheel to figure out their fate. Sometimes you get lucky and get a sweet, tasty liqueur. Other times, you might have to step up to the plate and down the dreaded Absinthe offering. 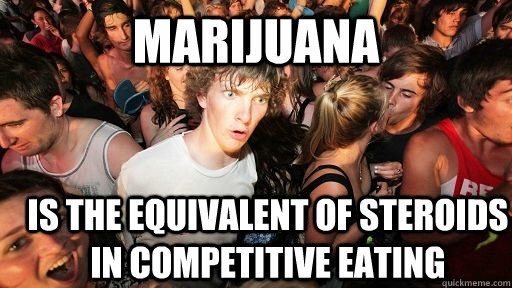 Either way, it’s a lot of fun! I think it would be a total blast to play this adult-oriented version of the childhood classic game. Instead of falling into trouble and having to slide down a slippery reptile, in this case, you’ll be consuming shots for your gaming transgressions. A couple games of this and the party will really get started. This poster is perfect for bartenders who want to easily access drink recipes for 68 classic cocktails. 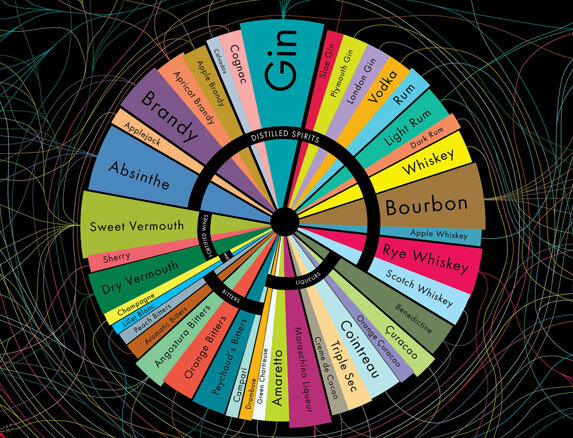 Using 40 different alcohols, this chart will keep them busy for hours and your thirst quenched for the same amount of time. Lines leading from the spirits to the drinks they play a role in (as well as which glassware to use) will make little sippers cocktail gurus in no time! This is available in 3, 4 (seasonal releases), 6, and 12-month options and includes 12 bottles of various craft beers every month, shipped directly to your door. The delivery also comes with a newsletter and the company advertises free shipping, but that may only be to certain locations (US, Canada). It’s the gift that would keep on giving! 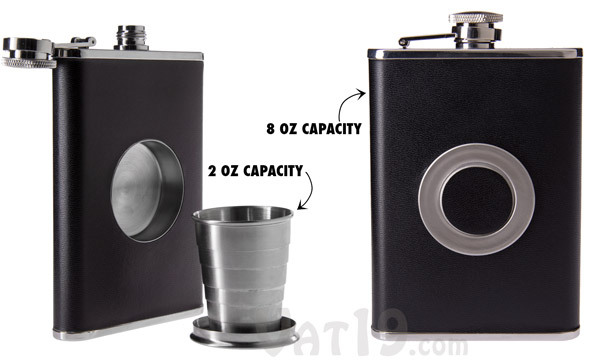 This is a great little device that includes a collapsible shot glass that you pull out of your flask. My only critique is that the space needed to tuck away the shot glass takes up some precious space for booze, but the package deal is something that will go quite some way in the long run. I’d sum up this book myself, but the Amazon description is so well done, I’ll just quote it: “Attempting to deconstruct America’s joyless obsession with sobriety, The Modern Drunkard offers today’s befuddled drinkers a comprehensive and instructive manual on the delights of alcohol culture.” You can also check out the Modern Drunkard website and subscribe to their magazine (six issues for $24). If you choose to buy someone a bottle of booze, figure out what they like and get them a higher end product they might not pick up themselves. If they’re an experienced drinker, try to find them a unique product they might not even know exists. Smaller bottles are also fun for stocking stuffers. Mrs. Sip got me a bunch of these last year, providing me with a wide array of flavours to experiment with. Of course, you can always pick up gift cards and coupons for your favourite drinking mate. Whether to their local liquor store or watering hole, they will be forever grateful. 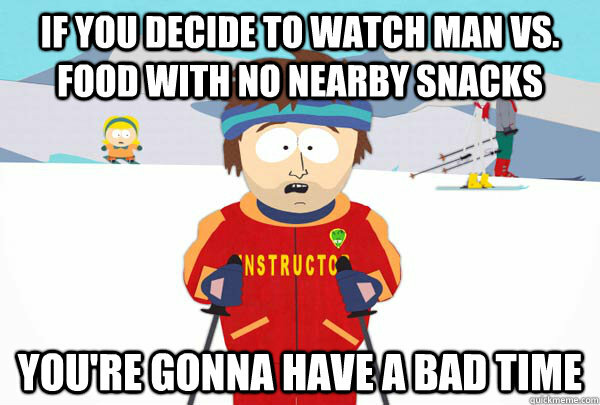 I’ve also seen sites like Groupon and Social Shopper have deals for winery and brewery tours. Send them on an adventure they’ll remember bits and pieces of! If you would like even more gift ideas, you can go back to the summer gift guide I put together earlier this year. There, you will find everything you need to get ready for the 2014 summer of boozing. There’s nothing wrong with looking ahead, especially in the alcohol world! This drink literally tasted like liquid apple pie. The best sips came when you got a fair amount of the Graham Cracker Rim with the cocktail and it had me longing for a warm slice of apple crumble. 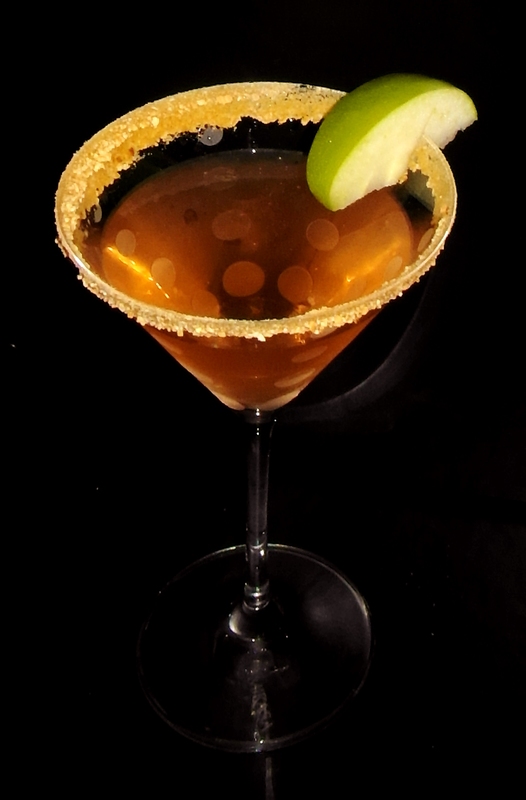 The Goldschlager and Apple Juice really do the heavy lifting here and make for a tasty martini.